That headline-grabbing statement is just one of many contained in the federal government’s newly released State of Canada’s Forests report. The report also addresses some misconceptions about deforestation and harvesting, and clarifies the difference between the two. Deforestation is permanent forest loss. It is the clearing of the forests to make way for new non-forest land uses, such as urban development or agriculture. Deforestation reduces biodiversity and wildlife habitat, affects water and soil quality, and has an influence on climate change. 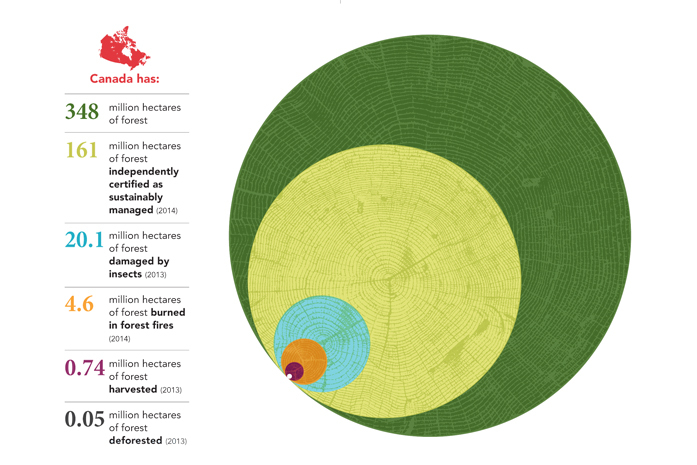 Deforestation in Canada is tiny. Less than 0.02% of Canada’s forests are deforested each year. Canada monitors deforestation closely, through satellite data, aerial photos and other information. Deforestation rates in Canada are declining. Since 1990, about 0.33% of Canada’s total forest area has been converted to other land uses. Forestry is not a top cause of deforestation. Of the less than 0.02% of Canada’s forests lost to deforestation each year, the main causes are agriculture (41%), resource extraction (37%), urban expansion and recreation (12%), forestry (8%) and hydroelectric development (1%). The report makes clear that harvesting does not cause deforestation, as trees are required to be regenerated after harvest. It also notes that 0.74 million hectares of forest were harvested in 2013, substantially less than the 20.1 million of hectares damaged by insects in 2013 and 4.6 million hectares of forest that burned in forest fires in 2014. Canada uses both natural and artificial regeneration methods to ensure that density and stocking levels meet regeneration standards. And what about that final question? When will Canada harvest its last tree? The answer is NEVER! Canada’s forests are renewable resources that are carefully managed to ensure that their environmental, social and economic benefits are available for generations to come. Canada has more forests independently certified as sustainably managed than any other country in the world – 161 million hectares. Learn more about the State of Canada’s Forests by clicking here.